Facebook Friending a Litigant in a case. Is it a good idea? 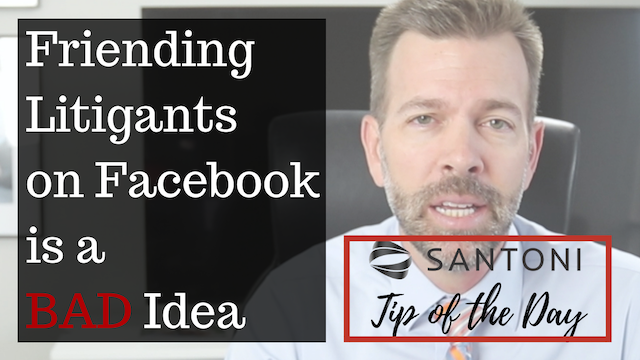 In this video, Tim Santoni talks about why it is a bad idea on multiple levels to friend a litigant on Facebook or any other social media platform. Making contact with a litigated party is not a smart move and whether you are an attorney, paralegal or an investigator working for an attorney on a litigated matter. You need to understand that the manner in which information and evidence is obtained is crucial. Evidence obtained through unlawful means can be deemed inadmissible and can open up the parties involved to sanctions, penalties, fines, etc. If you believe there is valuable evidence and information buried in the Facebook profile of a litigant there are open source investigation techniques (OSINT) that can often uncover this information without making a “friend” request. Before you engage an associate, paralegal or private investigator to conduct social media research make sure you understand their approach and know what you can be getting yourself into. Engage only with a trusted private investigator who has experience in litigated matters and is licensed.